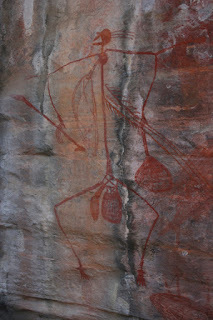 Today we were definitely tourists, with the day starting with a visit to see some Aboriginal Rock Art. 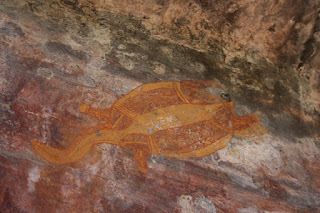 At Ubirr (pronounced oo-bir, with a short oo) we saw a range of different styles of paintings. Most of the x-ray paintings in the main gallery were painted within the last 1500 years. They show the abundant food available in the area surrounding Ubirr, including fish, waterfowl, mussells, wallabies, goannas, echidnas and yams. 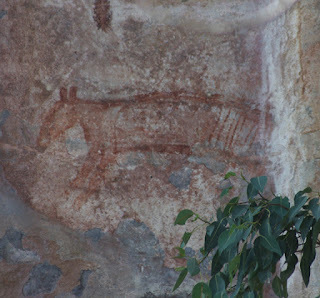 Close to the main gallery is a painting of a thylacine (Tasmanian Tiger), believed to have become extinct on the Australian mainland 2000 to 3000 years ago. We stopped off at the Border Store for lunch and were pleasantly surprised with yummy fresh salad sandwiches. The Border Store is so named as it is situated at the border of Kakadu National Park and Arnhem Land. You have to get a permit to go into Arnhem Land, it was declared an Aboriginal Reserve in 1931. 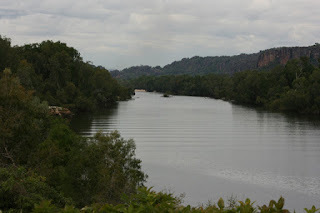 It remains one of the largest Aboriginal Reserves in Australia and is perhaps best know for it's isolation, the art of it's people, and the strong continuing traditions of it's indigenous inhabitants. After lunch we were on on a cultural cruise with Guluyambi on the East Alligator River. It was a very enjoyable 1hr 45min travelling along this beautiful - crocodile filled - river, taking in the wonderful pristine wilderness. we saw lots of crocs, birdlife and learnt a lot about the aboriginal culture, local mythology and the rivers abundant food chain. We even got to go ashore on the Arnhem Land side to take some photos upstream. Resident basking on the banks!! Tonight the caravan park we are staying at had one of the parks and wildlife rangers come and give guests a slide show and talk on the different areas and wildlife of Kakadu - very very interesting. So now I am very tired from all my touristy activities and looking forward to a nice nights sleep. Davine - once more what a fascinating glimpse into our amazing country. Thank you for sharing. I really like wall/cave art, so primitive yet complete. 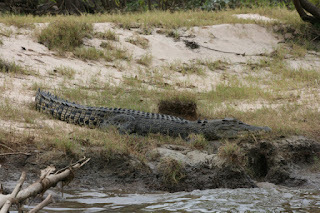 A river filled with crocs......so foreign to me but fascinated by the prospect! Thanks for this tour, Davine.